Sometimes it can be easy to say I’ve ‘been there, done that’ and not make a return visit. 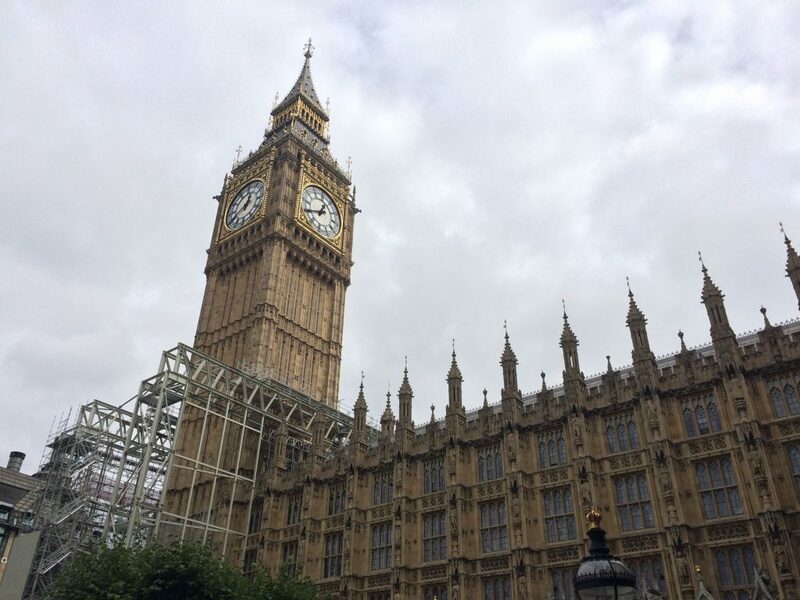 London attractions are constantly evolving and it was definitely time for me to return to the Houses of Parliament as my last visit was in 2014. I’d tried the Houses of Parliament Family Audio Tour then but this time wanted to try the Family Guided Tour with my 11 year old daughter. The family offering has improved again as the dedicated audio tour was a great addition and there was a deal for one child free with each adult when I was last there before. 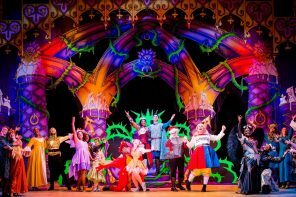 It’s now free for all children (up to 15 years old) but you do need to book them a ticket with yours. Guided tours are a real challenge with young people. 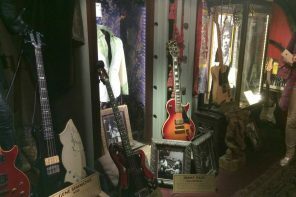 They don’t have the attention span to concentrate for a long time so the tours need to be interesting and engaging. It’s not kids being awkward; remember they are shorter too so often can’t see the Guide so get distracted, plus they don’t always understand the topics being discussed. 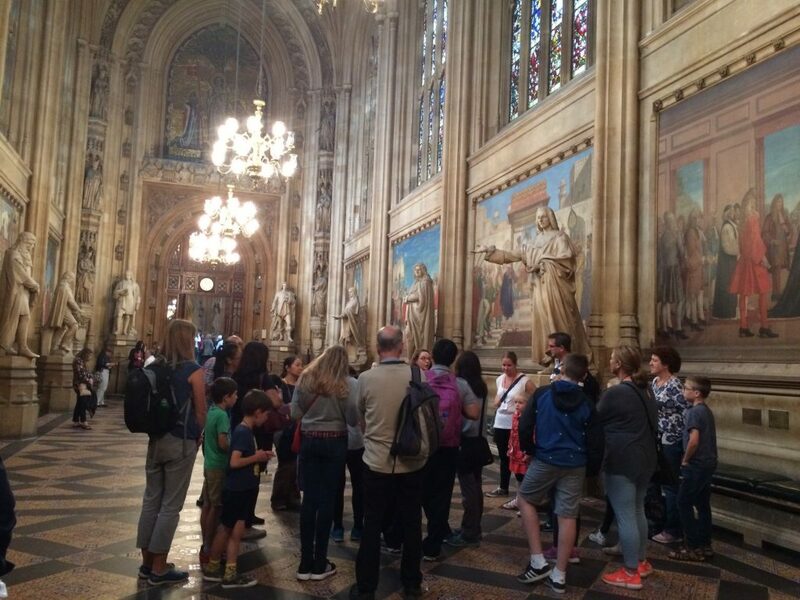 The Houses of Parliament have created a one hour tour for 7-12 year olds visiting with adults. 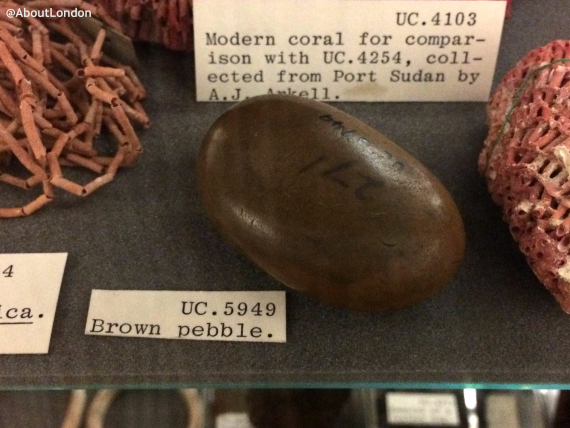 It’s more fun and has lots of silly facts to keep the group entertained. At the start of the tour, our Guide, Becky, explained the basic process for getting new laws. The way to keep us engaged was for us to pretend to be MPs. We had to come up with a proposal for a new law and we chose an idea nominated by one of the children in the group (everything free on weekends). We followed the proposal’s journey throughout the tour. 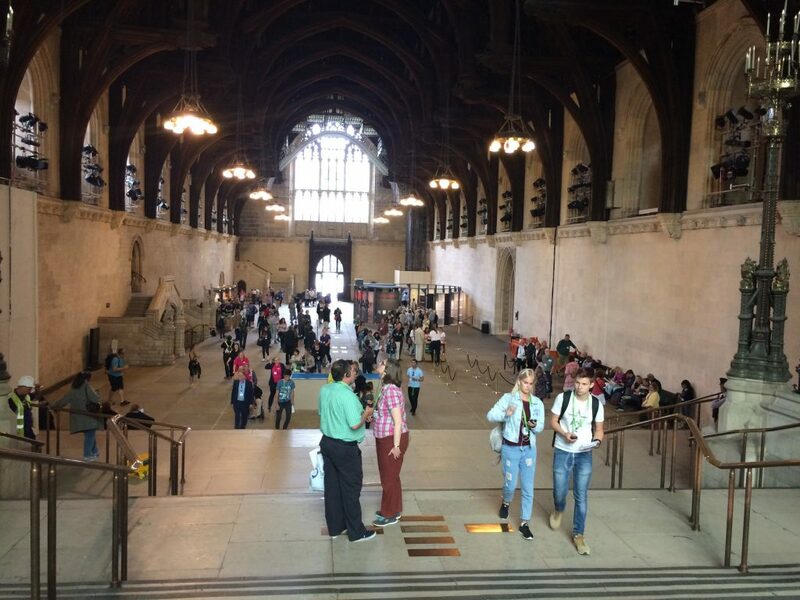 The tour starts in the medieval Westminster Hall and includes the House of Commons where MPs debate, the House of Lords and Central Lobby. On the standard guided tour you wouldn’t hear anything referred to as “Cool” but it was a common phrase on the family guided tour. 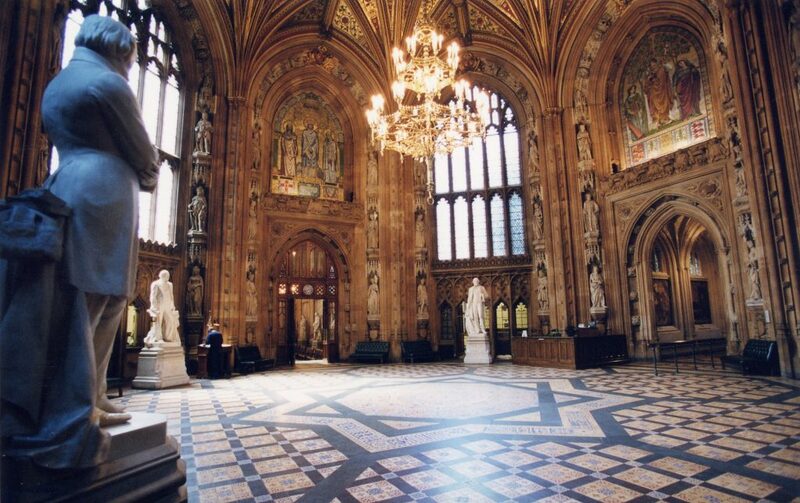 We learned Westminster Hall was used as inspiration for the Great Hall at Harry Potter’s Hogwarts School. And after we all tried guessing how old it is we discovered Westminster Hall dates back to 1097 – and that’s even older than grandparents! Before we moved on we found out the Houses of Parliament has 3 miles of corridors and 1,000 rooms so we were encouraged not to get lost as it would be the most stressful game of hide and seek ever. At the top of the stairs you can see New Dawn which is a contemporary light sculpture that celebrates the votes for women movement. (It’s above the door to St Stephen’s Hall.) We were encouraged to take a photo at the start of the tour and then go back to see it again as the ebb and flow of the illumination in turn reflects the rising tide of change. 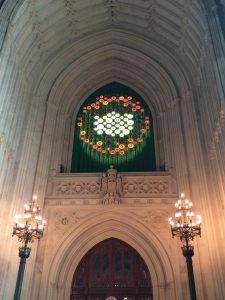 There’s the Dearsley Bequest stained glass windows that tell the story of women’s suffrage, and the damage to one of the statues where a suffragette was chained to it. Note the missing spur on the boot. 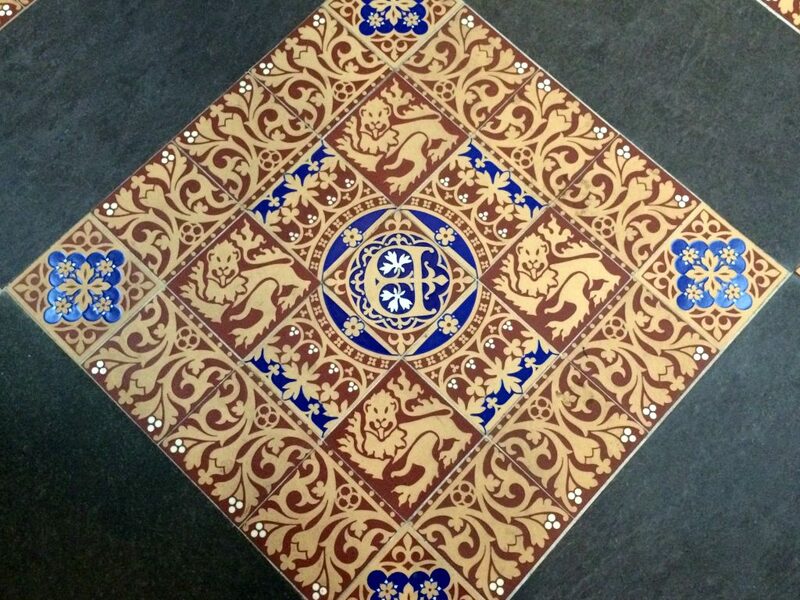 I had also heard a story about the lion’s on the encaustic floor tiles so wanted to look more closely. The story goes that the lions on the tiles down the middle of the room have their eyes closed so they couldn’t look up the wide skirts the ladies wore back in the day. 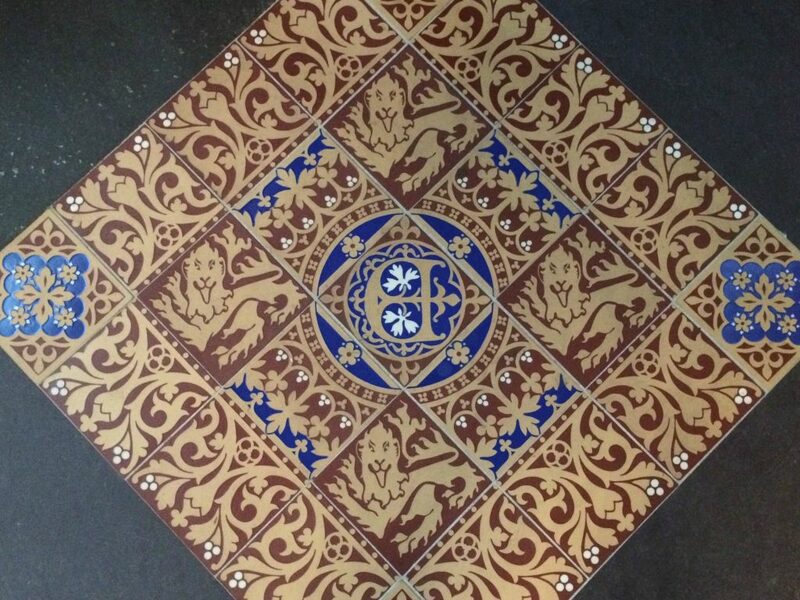 …and these are the tiles at the sides of the room (open eyes). After St Stephen’s Hall you are not allowed to take photos. Our Guide told us the building is Victorian so encouraged us to find Queen Victoria’s initials (VR) in the design. 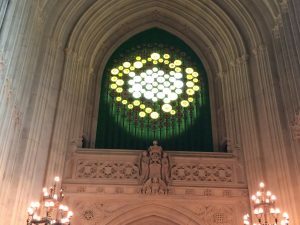 I also noticed the metal grilles that were in the House of Commons Ladies’ Gallery (before 1918). 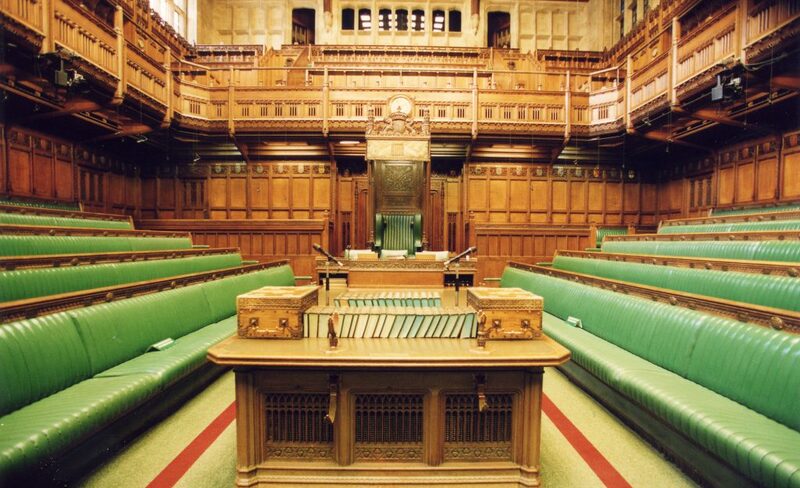 For our tour’s new law proposal (everything free at the weekends) we learned that if we can get 100,000 signatures on a petition we can bring it here and get the idea debated in the House of Commons. 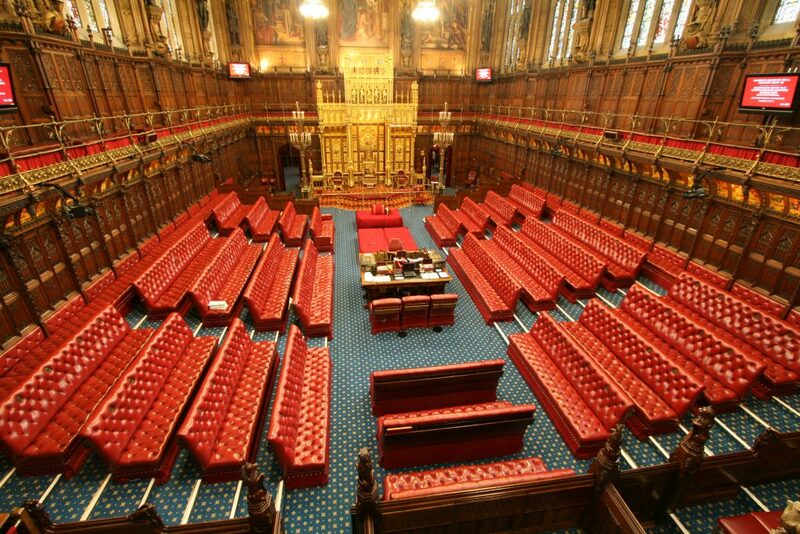 As the building is so large we got a tip to help know where you are inside by the colour of the carpet: green is for the House of Commons, red is for the House of Lords and blue is for the areas where the Queen is allowed. The history of why the Queen isn’t allowed everywhere was explained while we admired the Prince’s Chamber. We discussed the portraits here of Henry VIII and his wives, and how he created the Church of England. We also heard about how Queen Elizabeth I wanted to control the images of her seen by others so she didn’t keep portraits painted of her that she didn’t like. This was likened to deleting selfies although it was made clear that each portrait took the artist a long time to create. There’s a large marble statue here of Queen Victoria which her husband, Prince Albert, commissioned for her. She was a small, young woman and and he wanted to give her more confidence when she had to face the men at the House of Lords. But she hated the statue as she said it made her look as if she had a double chin, fat arms and it was somewhat scandalous that she was exposing a foot from under her skirts. The Queen comes to the Houses of Parliament once a year for the State Opening of Parliament. She sits on a 23.5 carat gold leaf throne in the House of Lords for this occasion but is not allowed in the House of Commons. As on any other tour of the building you are not allowed to sit here. In the Members’ Lobby, before entering the Chamber, there are four statues: Winston Churchill (Prime Minister during WWII), Lloyd George (who introduced the state pension), Clement Atlee (who introduced our NHS free healthcare) and Margaret Thatcher (first female Prime Minister). 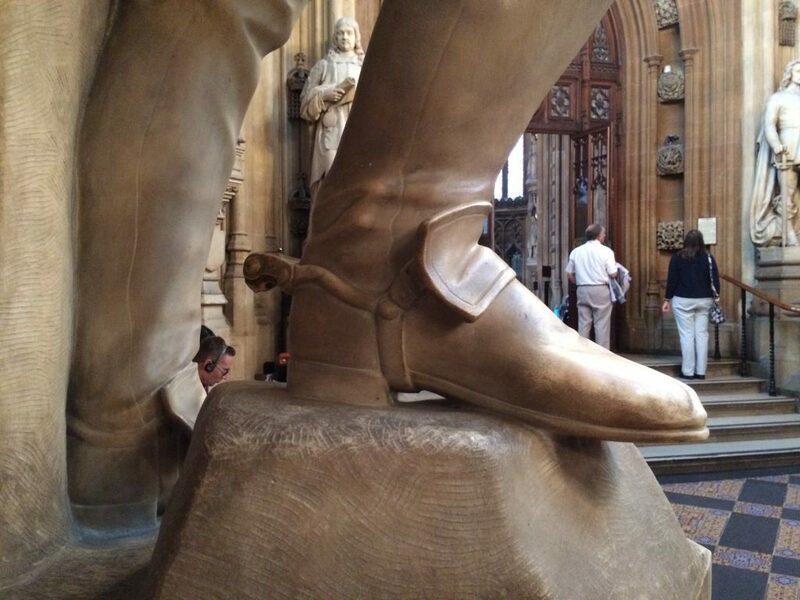 MPs decided it was good luck to rub the foot of Churchill’s statue but as it was getting damaged a sign had to be added: “Please do not touch statues”. When there is a vote, MPs enter via the Yes or No Lobby. We went to the No Lobby and there is a chance to sit down here. Do note this is the only opportunity to sit on the tour. Inside the House of Commons Chamber we could see it has a similar layout to the House of Lords Chamber although it is smaller. As there are 650 MPs and only 427 seats, MPs can reserve a seat by adding their name to a card and putting it on the seat before morning prayers. (This was compared to laying your beach towel on the sunbeds early in the morning when on holiday.) I’ll be honest, I was a little surprised to learn there are still regular daily prayers. As an aside, do look up above the Speaker’s Chair and above the Reporters’ Gallery. The stone gallery with windows is where the old Ladies’ Gallery was before women’s suffrage. The tour ends back at Westminster Hall. And the Guide is available for you to ask more questions. 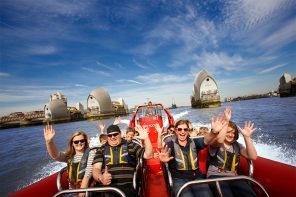 While this is a shorter tour than the full guided tour it was long enough for families. The Guide managed to keep the children engaged throughout, and did an excellent job of reminding us of our law proposal (everything free on weekends) and the possible pitfalls along its journey too. The Guide was definitely trained to talk to families and was good at ensuring the children in the group were asking and answering questions. She was also able to answer curveball questions such as my interest in women’s suffrage. It’s a different style of family guided tour to the one I tried at The Royal Mews – the Royal Collection have gone for engaging the tour group with questions and ‘What do you think?’ ‘Which do you prefer?’ type of conversation starters – whereas Parliament have gone with following the journey of a new law throughout the tour but both styles work well. My daughter and I came away knowing more (and we’ve both been here a few times). Initially, I was a bit concerned we would be in a rush to keep ahead of another tour group but our Guide managed the situation well and let others go ahead so we had time without stress. While we were cautious of the restrictive nature of a guided tour (audio tours always seem more independent) I really enjoyed this family guided tour and was grateful for the opportunity to ask questions along the way. With children now going for free with is definitely recommended. Disclaimer: As is common in the travel industry, the writer was provided with complimentary services for review purposes. While it has not influenced this review, I believe in full disclosure of all potential conflicts of interest.